Can be customized / extended to more panels as per your need. The unit consists of 2,4,5,6 Panels each Panel Size is 20 inches front and 72″ (6Ft) approx. height. The Panels can be folded and moved from one place to another. 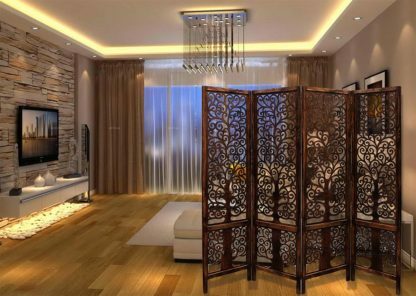 The Room Divider can be customized as per your need. The unit can be extended to more panels. The finishing of the unit is antique. The unit is hand-buffed to get an antique finishing which adds a touch of elegance and style to you living room. 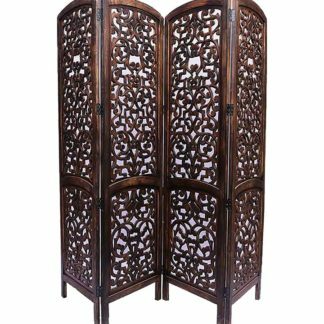 The Wooden Room Dividers / Partition Screens is hand-carved from premium quality Mango Wood & MDF(Medium Density fiberboard).The outer frame is made up of fine quality Mango wood and the inner carving is done on MDF. Hardness: It is considered to be a hardwood. Hardwood is usually difficult to cut and shape. However, this is one of the softest hardwoods around creating it suitable to be used in Wooden furniture like Wooden Room Dividers. Grain and Texture: Mango wood grain are often either straight or interlocked/curly and looks great in its natural form though polishing the wood adds to its beauty. Color: Heartwood or the core of a mango tree wood is usually golden brown though it may also be yellow or have pink and/or black streaks.also, in MDF is easy to paint in many different colors. High Water Resistance: It is highly water-resistant and great for creating outdoor furniture. Polishing can also increase its durability. Great Designs: Unlike other hardwoods, mango wood is kind soft and as such easier to cut and shape. Intricate carving is also potential on mango wood making it appropriate for designer or antique look furniture. Price: The wood has steady supply sources and is a sustainable wood making it less expensive than other hard woods like Teak and Sheesham. It is really good, and I loved it. Finishing is superb.